AND IMPORT PAYMENTS TO BANGLADESH BANK. 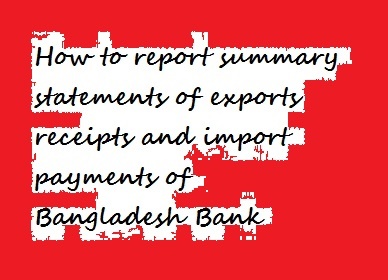 How to report summary statements of exports receipts and import payments of Bangladesh Bank: Submission of foreign exchange returns to Bangladesh bank is statutory obligation of the banks according to the foreign exchange regulations act. Where there is no transaction to report during a particular period, a Nil return should be submitted. Authorised dealers must submit a summarised statement to the Bangladesh Bank in respect of their transactions in different currencies in which position is maintained by them. The summary statements are basically abstract of the authorised dealer’s ledger accounts and consist of totals under specified heads. e) 5-6: for transactions on sales and purchases of approved foreign currency notes, f) FCS-7. for transactions in foreign currency accounts of Bangladesh nationals working abroad. g) EFCS-8. for transactions in exporter’s foreign currency retention quota accounts. Further it is to be mentioned here that the transactions in each summary statements mentioned above must be supported by appropriate schedules used for capturing different detailed foreign exchange transactions and relevant exchange control fonrs (i.e EXP. IMP). a) Export bills drawn under confirmed and irrevocable letters of credit. d) Export bills pertaining to branch not maintaining its own currency accounts. The detailed explanations of these procedures for transactions have been given in Guidelines for Foreign Exchange transactions (1996) Chapter-2, page-2. The export transactions of different categories i.e. cash/ barter/STA etc. are generally recorded in the scheduled A-l/0-l and A-210-z along with the EXP forms. A-l schedule is used for reporting purchase of foreign currencies or debit to non-resident Taka account of correspondents against EXP forms certified by authorised dealers. In case of advance receipts in respect of goods to be exported (mode of advance receipts may be cash or for debit to non-resident account), the transaction be reported on schedule A-210-2. The particulars ol transactions should be listed on this schedule in triplicate. It should also be noted that, if an advance receipts is obtained for export of goods, the AD must mrake out an Advance Receipts Voucher. In case of imports, the payments are reported when the import bill drawn under the letter of credit is finalised and the foreign currency account of authorised dealers are debited. The imports of any nature financed under cash arrangement are reported on schedule E-2. Separate schedule E-2 must be made out for transactions in each currency and the schedules should be attached to respective ‘S-1’, ‘S-2’, ‘S-4′ Summary Statements supported by Form IMP. The reporting of Import payments (without L/c) under F.C Account financing by way of draft, MT. TT. etc. should be made on Schedule FCP-l and in case of such imports against letter of credit should be reported on schedule FCP-2. The separate schedules for these transactions should invariably be prepared and the total import under this system should be shown in Summary Statement FCS-7 as usual. The reporting of imports under loans/credits and grants is made in different schedules styled as E1-l/E1-2/E1-3. a) El-l is used for reporting of import transactions where no remittances are involved. The heading El-l is to be retained and headings El-2/El-3 are to be deleted. b) El-2 is used for imports under reimbursable loans and credits under which payments are first made out of Bangladesh’s cash resources and are subsequently reimbursed Ly loan/grant giving agency. The heading El-2 is to be retained and the headings El-l/EI-3 are be deleted. c) El-3 is used for suppliers’ credit under which remittance of down payment is involved. The heading El-3 is to be retained and the headings El-l and El-2 are to be deleted. Payments of interest should, however, be reported on TM forms and schedule E-3 and the purpose should invariably be coded against the interest code number. The schedules A,-1lA-2 are used for export receipts and E-2, FCP-1. FCP-2. EFCP-1. EL-l/EL-2/EL-3 for import payments. The spaces provided in these schedules for ‘Country’, ‘Commodity ‘, ‘Category’ etc., are filled with codes consist with descriptions given in the EXP and IMP Forms. The commodity codes are to be picked-up from the code-Guide Revised FIRST SCHEDULE “[customs Ac1.1969 (Act iv of 1969) of FIRST SCHEDULE],’The reporting of 8 digit Commodity Code has been introduced from july, 2002.
c) Normally export realisation should be reported on schedule A-l on the basis of the documents (Exp, invoice etc.) and ‘advance receipts’, if any should be reported on A-2 But it has often been found that some ADs report the realisation as well as advance receipts on A-l which in turn creates problem for identification of actual realisation and advance receipts. The statistics on export and import are used to prepare the balance of payments of the country, for making country’s export policy, projection of foreign exchange reserve. Preparation or foreign exchange budget etc. Basic data derived from the returns should be free from errors and misclassification. The mistakes/errors lor coding of the transactions in the schedules may lead to misclassification of foreign trade statistics and mislead the policy makers and planners associated with international trade agreements and negotiations. Therefore, it is very important that the ADs should report various information including export to Bangladesh Bank in the prescribed format with utmost care and attention. In order that exports or other invisible earnings of EPZ are separately accounted for, the Authorised Dealers will open Notional Account of EPZ for their EPZ constituents to which all foreign currency receipts in respect of the EPZ constituents will be credited, Deposits into the Notional Account will not be taken into the regular exchange position of the Authorised Dealers. The portions of export proceeds of EPZ industries encashed to ‘taka will be taken into the regular exchange position of the Authorised Dealers and reported in the normal summary and schedules as invisible receipts by debit to Notional Account. EPZ will be treated as a separate economy/territory. A separate country code has been assigned for EPZ. Under which all foreign currency transactions with EPZ, (between EPZ and Bangladesh) will be reported. For the transactions of various nature, appropriate existing codes should be used. Authorised Dealers should maintain separate register/ledger for foreign exchange transactions of EPZs. The forms for prescribed Returns and summary statements to be used for EPZ transactions should be printed in light yellow coloured paper. Export Processing Zones (EPZs) have been established by an Act namely. Bangladesh Export units operate in the EPZs. a) Type A: l00 percent foreign owned including those owned ordinarily resident abroad. c) Type C: 100 percent Bangladeshi entrepreneurs resident in Bangladesh. Exports from EPZs are subject to the usual requirement of declaration of exports in EXP Form and repatriation of export proceeds. For identification, EXP Forms for these exports should be rubber stamped or overprinted with words – EXPORT FROM EPZ” in bold letters. The following procedure shall apply to release ol foreign exchange to the enterprises against exports made from the EPZs. a) 100% of repatriated export proceeds of a ‘Type A industrial unit in EPZ may be retained in FC account in the name of the unit with an AD in Bangladesh. Balance in the FC account may freely be used to meet all foreign payment obligations including import payment obligations of the unit and payment obligations in foreign exchange to the BEPZA. Balances from the FC account will also be freely encashable for local disbursements or for crediting Taka account maintained with an AD for meeting Taka payment obligations like wages, rents, rates, taxes etc. Taka accounts maintained with ADs by Type A units in EPZ may be credited only with encashements of funds from FC accounts or of other inward remittances from abroad. b) Up to 80% of the repatriated export proceeds of Type B and Type C units other than those in the garments sector may be retained in FC Accounts maintained in the names of the units with their ADs; for a Type B or Type c unit in the garments sector, up to 75% of the repatriated export proceeds may be credited to FC account maintained in the name of the unit with an AD. The remainder of the export proceeds should be encashed to Taka at the prevailing exchange rate. All foreign payments obligations of Type B and Type C units including import payments and repayments, of foreign loans may be met out of the balances in their FC accounts, payment obligations in foreign exchange of a type B unit or to the BEPZA may also be settled from balances in its FC account. Balance in the FC accounts of the Type B and Type C units are Feely encashable to Taka for local disbursements. on EXP forms and repatriation of proceeds is applicable to these exports to the EPZ enterprise. Reporting of Transactions under Exporters’ F,C. Retention Quota A/Cs. b) The amount in foreign currencies (except ACU dollar) credited to retention quota account (out of repatriated export proceeds) shall be shown under serial No 9 in the sales side of S-l as “Transfer-on account of exporters retention quota to EFCS-8′, As a contra this amount will be shown in the Deposits side of statement EFCS-8 at serial No. 1 schedule EFCR- l will accompany this statement. c) The amount in ACU dollar credited to retention quota account out of export proceeds repatriated under the ACU mechanism shall be shown in the sales side of Si-2 at serial 9 as “Transfer to S-l on account of exporters’ retention quota’,. Simultaneously, This amount will be shown in the purchase side of S-l at serial No. 9 as Receipt from S-2/S-4 on account of exporter’s retention quota”. The same amount will be reported as contra in the sales side of S- I and EFCS-8 as described in sub-para (2) above. a) Merchandise exporters are entitled to a foreign exchange retention quota of 50% of repatriated f.o.b value of their exports. However, for exports of goods having high import content (low domestic value-added) like POL products including naphtha. furnace oil and bitumen. Readymade garments made of imported fabrics. Electronic goods etc. the retention quota is l0% of the repatriated f.o.b value. b) Foreign exchange out of the retention quota may be maintained in FC accounts with the concerned ADs in US dollar, pound Sterling. Deutsche Mark or Japanese yen upon realization of the export proceeds. Balances in these accounts may be used by the exporters for bonafide business purposes. such as business visit abroad, participation in export fairs and seminars, establishment and maintenance of of offices abroad. Import of raw materials, machineries and spares etc. without prior approval of Bangladesh bank. It should be noted that since exporters will use foreign exchange from the retention quota business visits abroad. no separate business travel quota will be admissible (other than for new exporters). Foreign exchange from the exporter’s retention quota cannot used for investment abroad by the exporter. c) Foreign exchange out of exporter’s retention quota may also be kept as interest bearing renewable term deposits with the concerned AD in Bangladesh in US dollar, Pound Sterling, DM or Japanese yen with minimum balance of USD.2,000.00 or 1,500.00 or equivalent period of such term deposits may be determined in accordance with normal banking practices/normal banking ‘ considerations. Interest on such deposits may be allowed at rates comparable to the prevailing Euro deposit rates for the relevant currency.